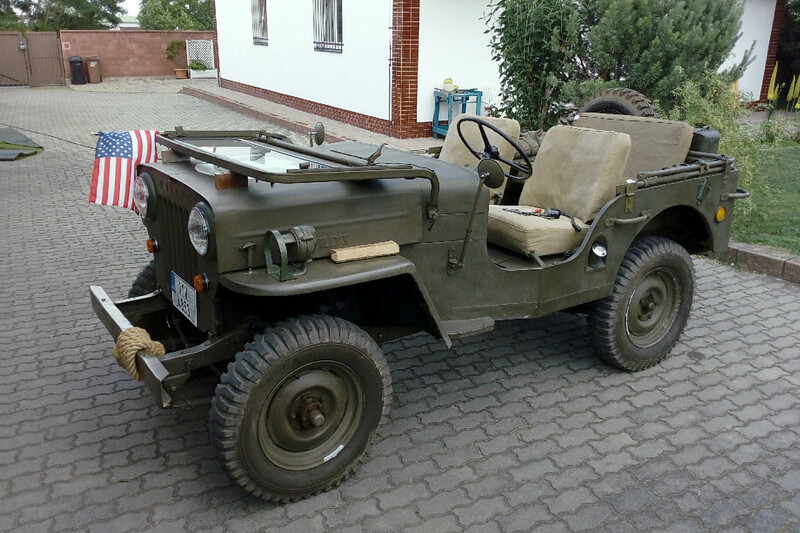 Jan lives in Prahy in the Czech Republic, and has one of the many Swiss Army Jeeps which have been given the look of a U.S. Army Jeep, still a legendary and popular vehicle in Europe. 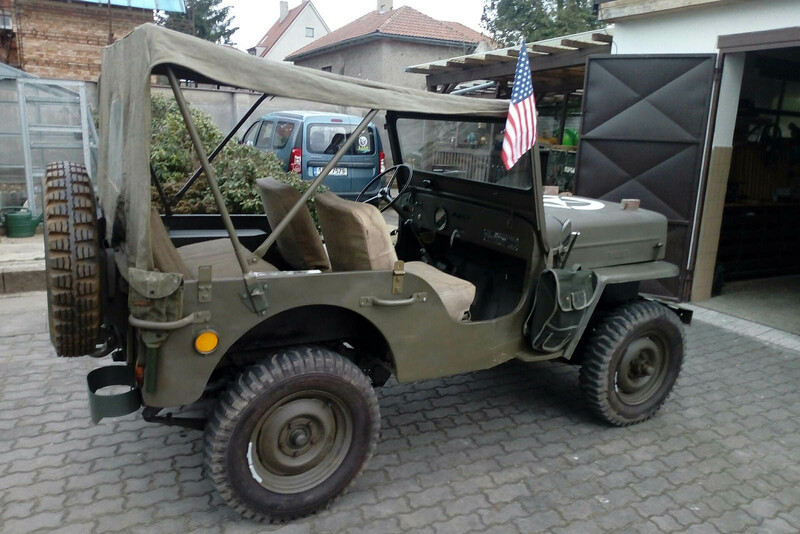 Jan sent these photos in late 2018 and said, "My Jeep served in the Swiss army and at the airport until the end of the 1990s, and then in the Czech Republic." "I am the second owner here and almost every weekend we take trips with him and attend meetings of the owners of similar U.S. vehicles throughout the Czech Republic. The car is excellent and it has become a member of our family, and especially for my kids (two girls 10 and 5 years old) it is the place where they are playing and looking forward to more trips." See also a rear view (150K JPEG). 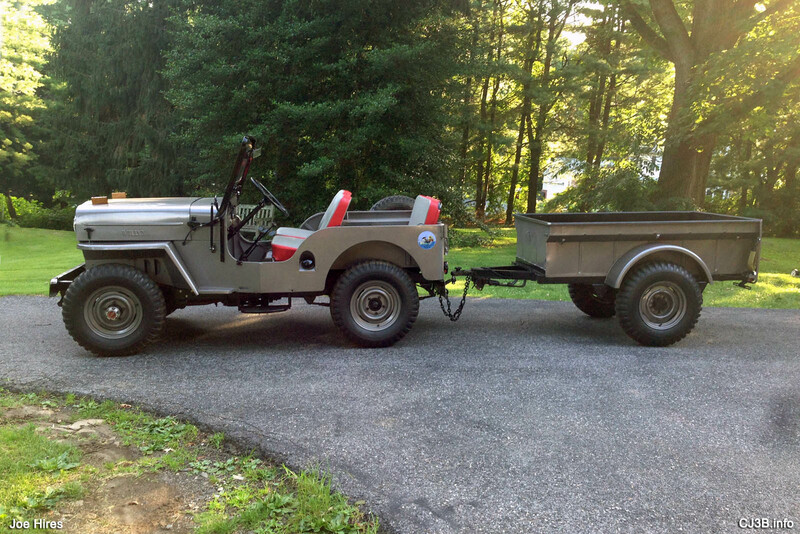 Joe is in Westchester PA, and back in 2004 he had sent some photos of his low mileage Jeep. In 2017 he says, "It's been a while but I finally had my 3B fixed up by Merlin Hanson in Maryland. 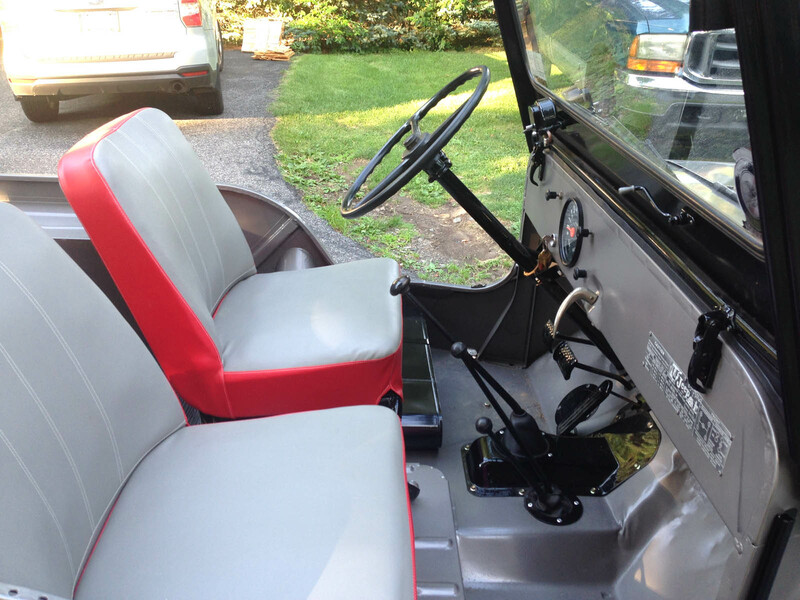 He cleaned it, took dents out, painted, redid the seats, and added a rear seat (260K JPEG). The only mechanical issues were a seal by the e-brake drum, and gaskets and a tune up. He also replaced the water pump -- I guess it was leaking a little. It now has 1815 original miles -- it was 1796 when I first sent you pics." 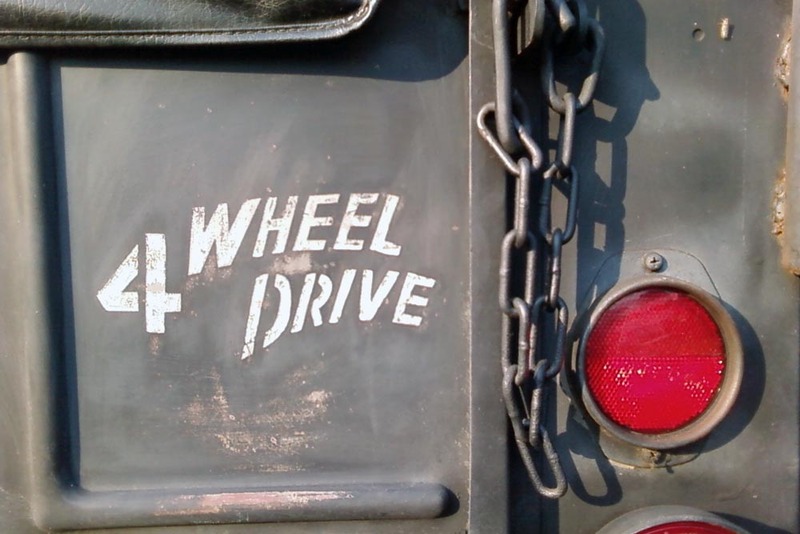 Click the photo at left to see the Jeep with its matching trailer. 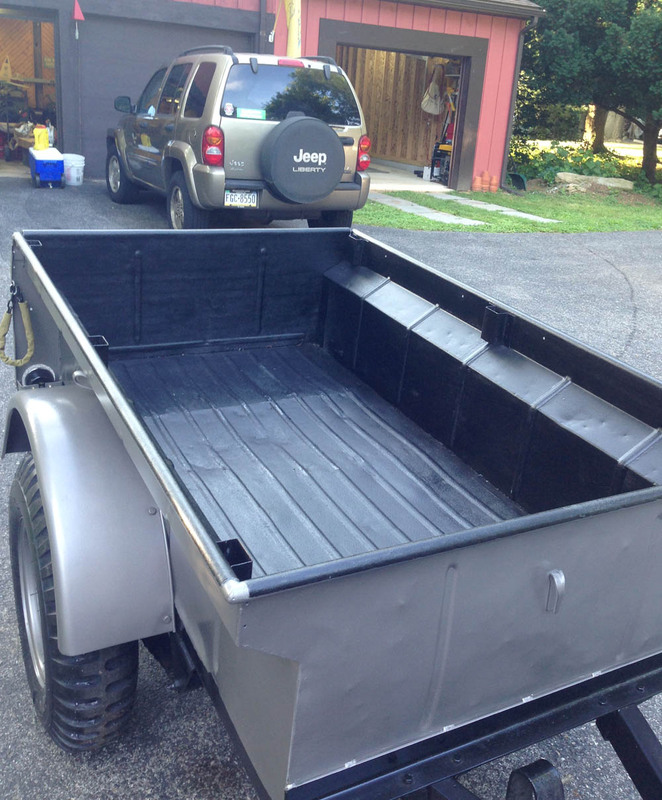 "I also bought a '47 Bantam trailer (190K JPEG) which Merlin fixed up and painted Steelglow Gray. It was my wife's idea to purchase it and have him fix it up. 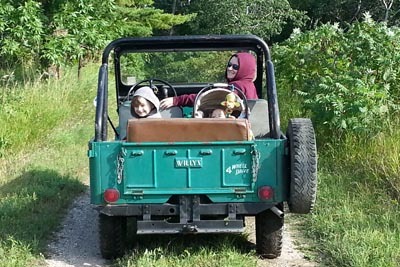 She said it would be fun to use the Jeep for spring plant sales, but as you know there is not a lot of room in the back, so she said we should get a trailer." 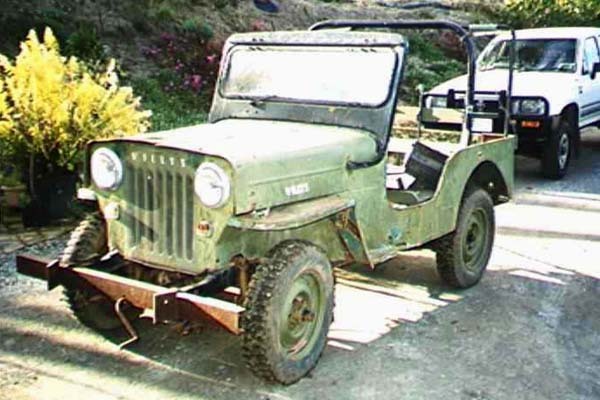 Back in 2004, Joe wrote, "My Dad bought this Jeep in 1960 -- it sat in my garage most of its life. My two brothers beat the hell out of it, hence the dents and scrapes, but it has NO rust at all. Yes the mileage is correct -- 1700 miles. The last time it was inspected, in 1988, it still had the original tires -- 15" Suburbanites. They were dryrotted from sitting, but they still had the nubbs on them. 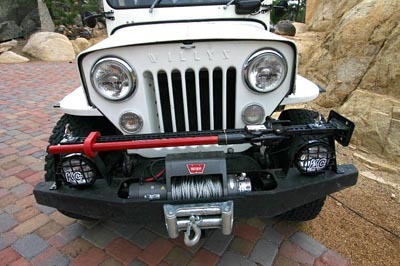 "I use the Jeep to pull my log splitter and to patrol my property for wildfires, and just to have fun. It's had a pretty easy life and it will stay that way. My future plans are to paint it and get the dents taken out of it. My buddy came over and took the pictures. The kid is his son -- can you tell he's a 3Ber all the way?" "I now understand why they call the F134 the Hurricane. I went through the hurricane here in PA in 2003 and my whole house got flooded and all of our cars were ruined including the garage. The 3B was submerged halfway up the engine block, then later the horn started going off, probably a short. 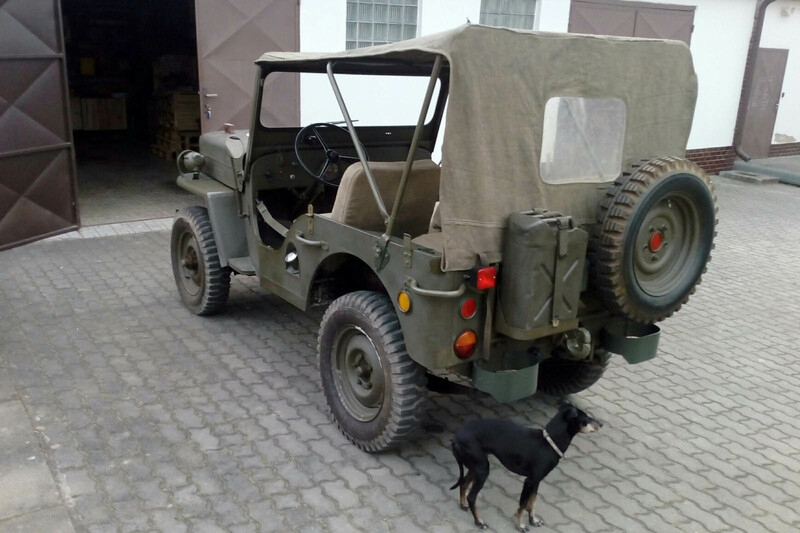 So the next day I thought that the Jeep was ruined and I tried to start it thinking that it wouldn't start, but to my surprise it fired right up without skipping a beat." See also more pictures from 2004: a side view, a rear view, and the dashboard (100K JPEGs). 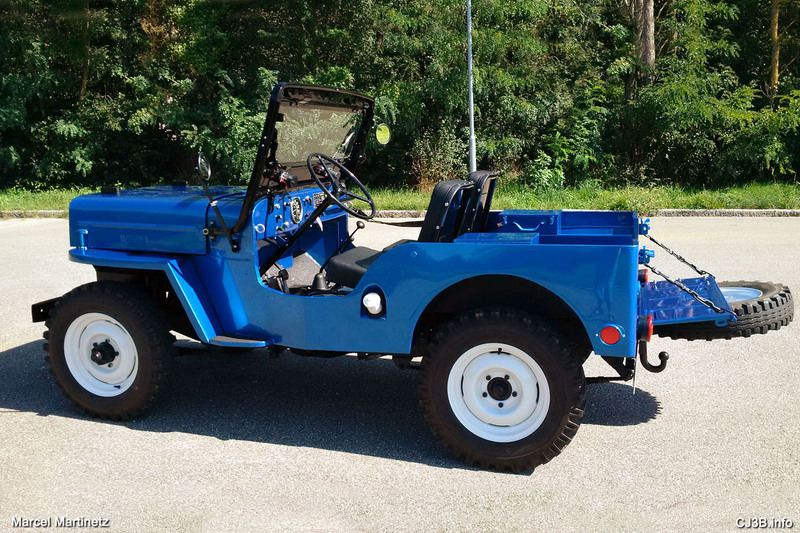 This early 59 is a former Swiss Army Jeep and is now in southern Germany where Marcel repainted it in 2016. See New Look for Swiss Army Vet for more photos and details. 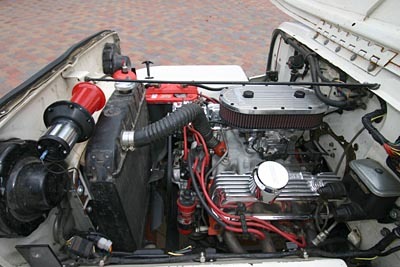 Chris in Barnesville, Minnesota wrote in 2014, "I'm the third owner of my high hood. I went down to Colorado to pick it up. It was very exciting to find. Low miles with only 30,000 on it. Totally original with original paint and parts (no bondo or years of bad repairs). The engine runs great along with original drivetrain. All the lights, blinker, gauges (even the gas gauge), heater, and horn work like they were new. 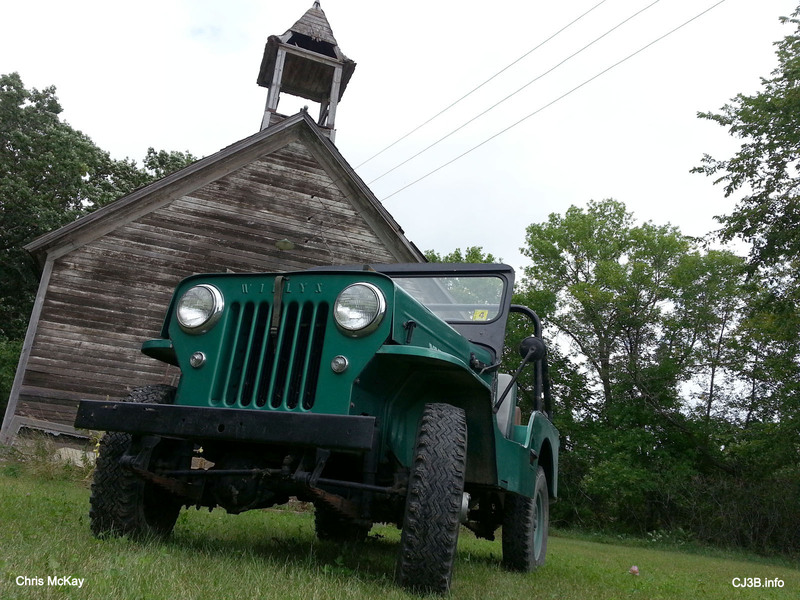 The Jeep is also riding on all original Suburbanite tires (430K JPEG). "I had to do a tune up and a major cleaning when I purchased it. It was stored in a barn since 1990. I would like to reupholster the seats and leave everything else the same. 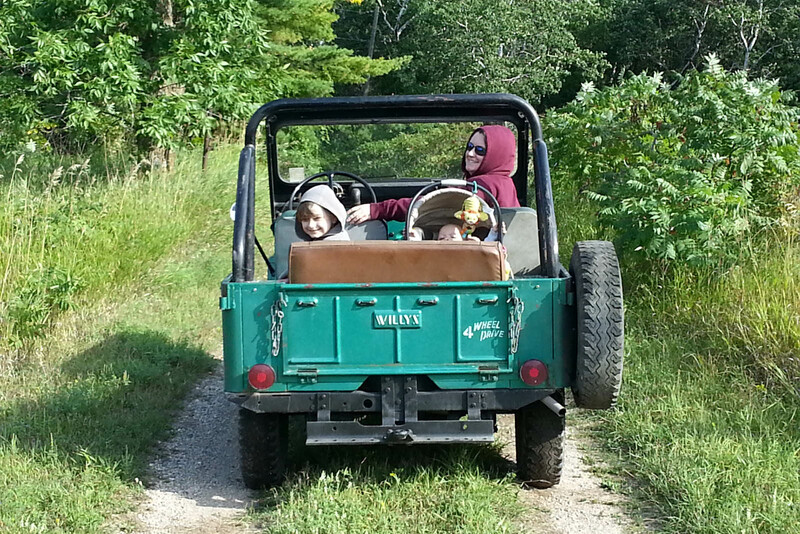 Riding the Jeep is what my family does in our free time. We search out places just to take the Jeep and explore. It's one of the things that puts my one year old to sleep. He gets so excited every time he sees it. 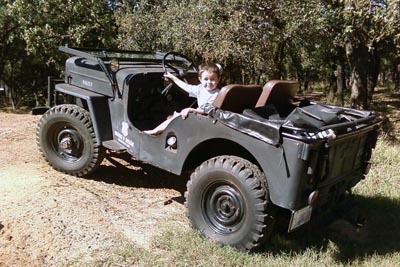 And my 5 year old calls it her Jeep." 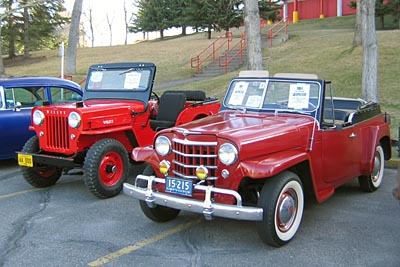 Tom's Jeep in Illinois has no WILLYS stampings on the hood or grille, which appear to be original. 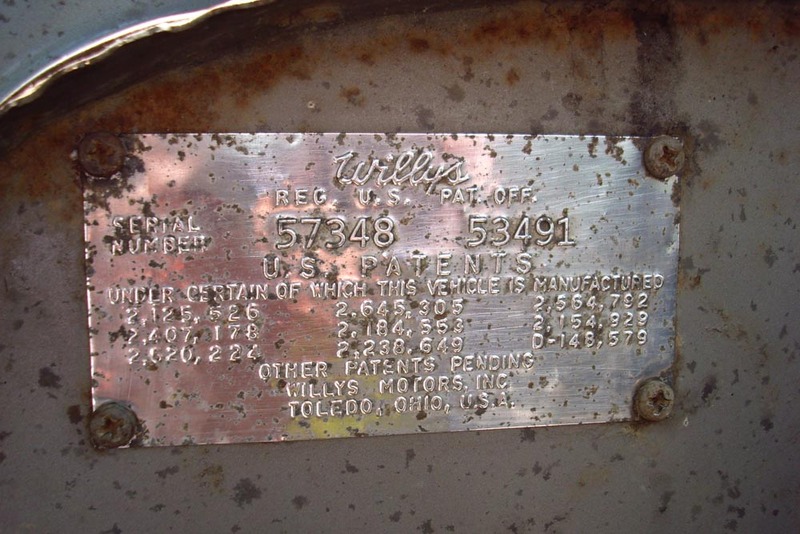 It carries serial number 5734857461 (100K JPEG) on the firewall, which makes it a late '59, but that would still be at least a year before Kaiser phased out the Willys name on the sheetmetal. Possibly an early experiment with the new parts, or a careful replacement job at some later date. 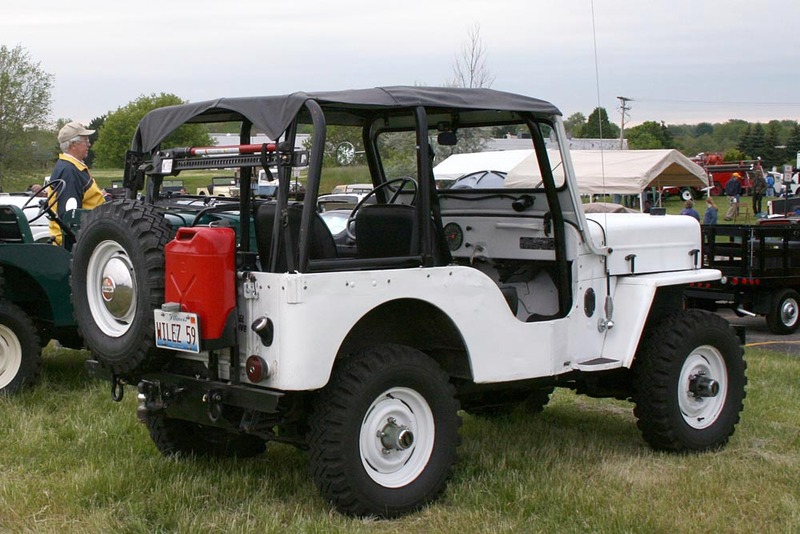 This photo shows plenty of rear-mounted hardware: gas tank filler, jerry can, spare tire, hi-lift jack, trailer hitch and tow rings. This 3B is also one of the first with the fresh air heater, seen here. 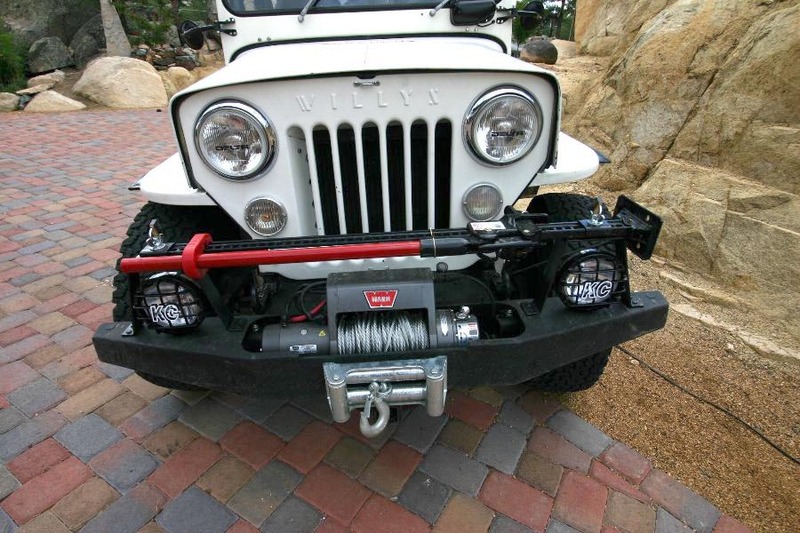 Aftermarket add-ons include off-road lights, electric winch, two-way radio, and front and rear locking hubs. 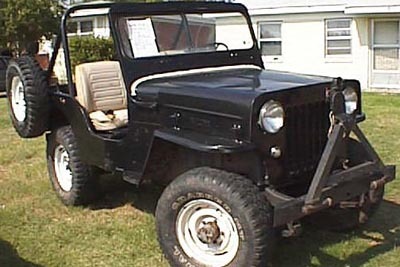 See a front view photo (110K JPEG), also taken at the Spring Willys Reunion 2007. 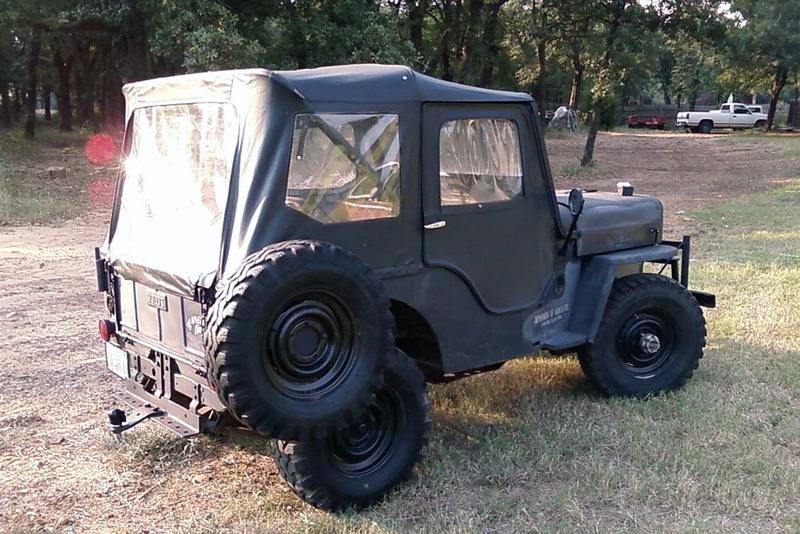 "I purchased my 1959 CJ-3B in November of 2007 for $3200 in Denton, Texas. I live in Roanoke, Texas. 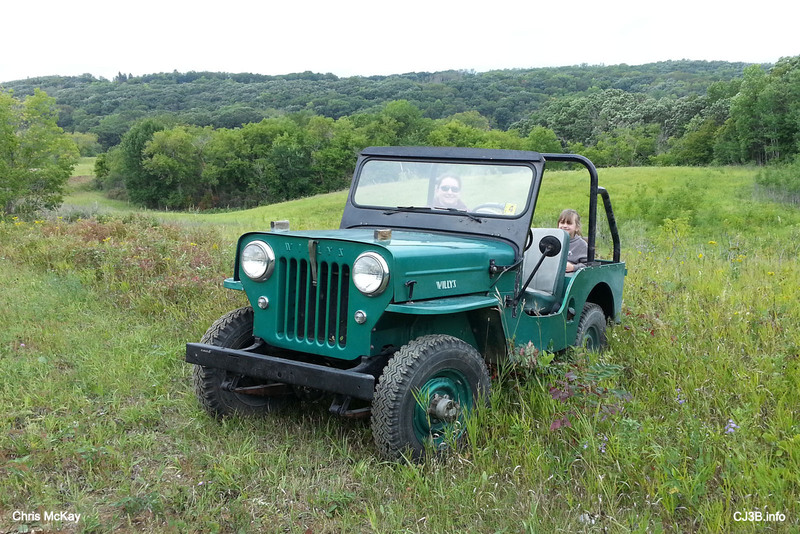 I didn't even know I had a CJ-3B, I just wanted an old Jeep for me and my grandson Taylor to putter around in on the weekends. 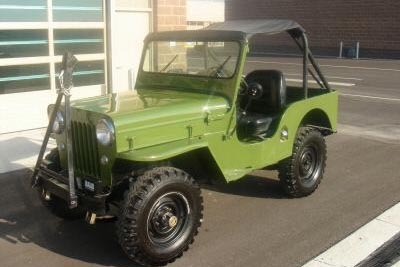 After discovering CJ3B.info, I've become extremely excited about vintage Jeeps! 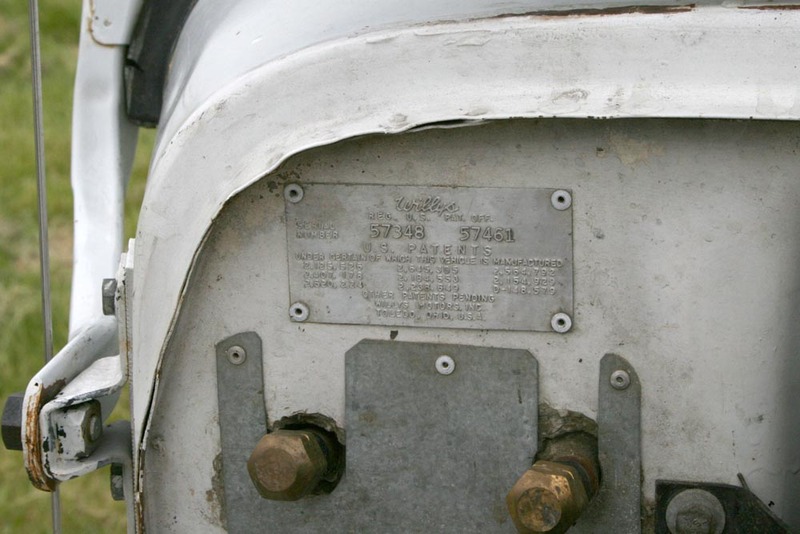 I haven't looked for the engine serial number, but the VIN is 57348 53491 (210K JPEG). I've done a title search and the Texas DPS only has records back to 1968. The two previous owners used it as a hunting vehicle and spray painted it flat black. 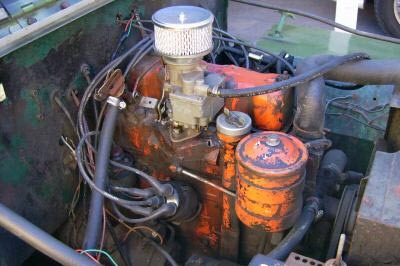 It has very, very little rust and is all original, even the Carter YF carburetor. "I want to redo the brakes, put on new tires and shocks, and some other minor things. 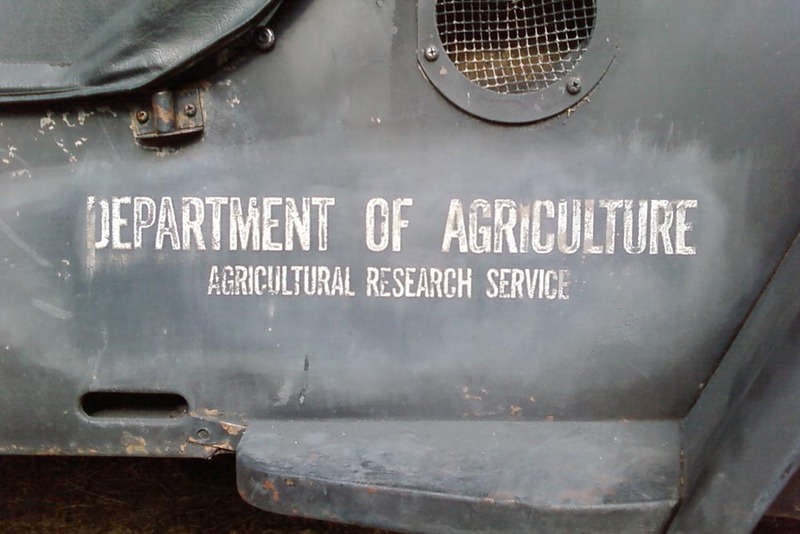 "I did some light sanding on some areas and discovered the original 4 Wheel Drive stencil (160K JPEG) on the tailgate, and also some other painted labels (160K JPEG) that read 'Department of Agriculture, Agricultural Research Service' on the right side (250K JPEG) and left side, just behind the front tires. I was hoping soemone might be able to provide me some information about this. 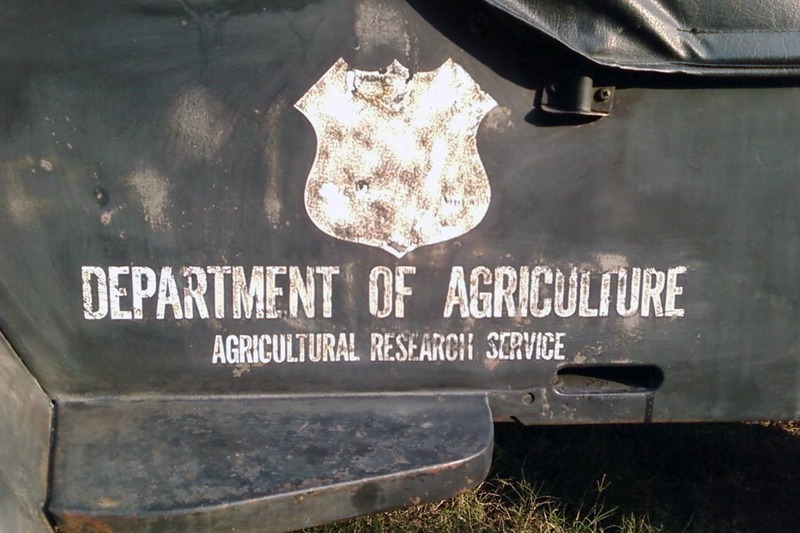 The label on the driver's side has a shield emblem (180K JPEG) with a blue star at the top but I can't make out anything else." James Alan Brown in Womelsdorf, PA must be an animal lover. 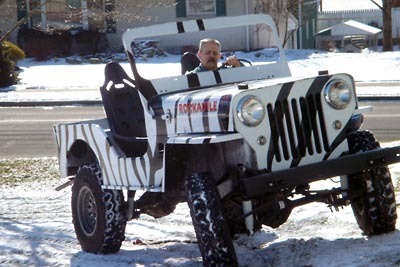 He painted his freshly restored Jeep in zebra stripes, he called it the "Rockadile", and he even said, "I'm bringing this rust heap back from the dead." But eventually he sold the Jeep. 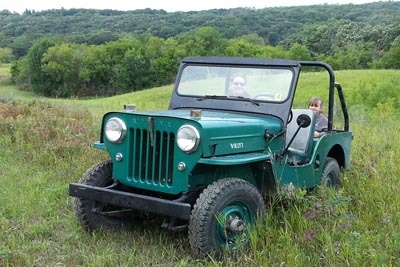 See more photos and details of this CJ-3Beast in PA.
Aaron is in Nebraska, and as of early 2007 he is 14 years old. His uncle, Kevin Gilmore, says, "My nephew loves the early Willys Jeeps. 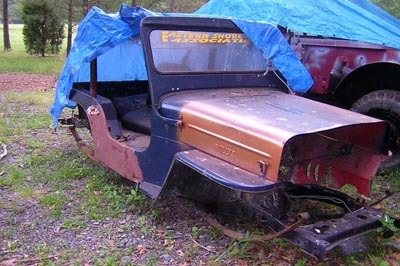 I searched for several weeks trying to find a project Willys for him and me to restore together. I found one and my mother bought it for his first car! 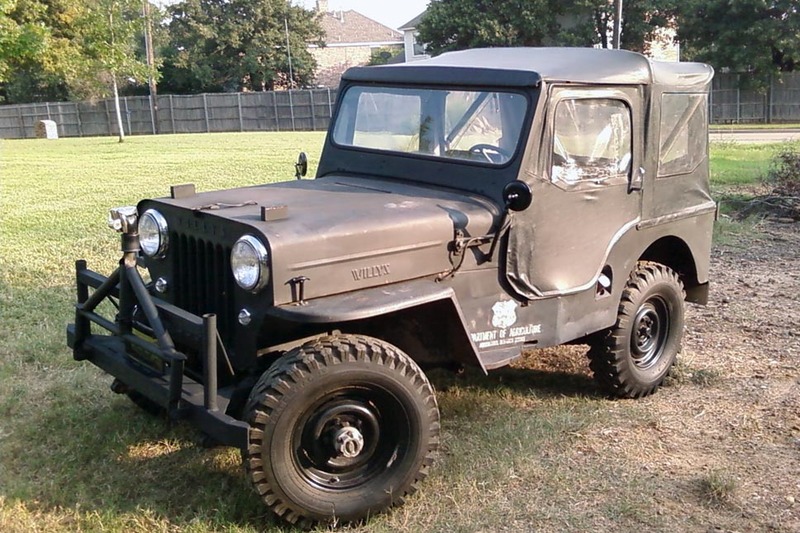 It's a 1959 CJ-3B. Aaron is a war history buff. His Grandfather got him interested in the military as a young boy. He is a very good young man and is a straight "A" student. We're all proud of him. Now it's time for his uncle Kevin (me) to get him started into automobiles. I really wanted to buy one that needed to be restored so by the time Aaron turned 16, we would have it done. "For the time being, only the clutch and transfer case need attention (seals leak). I am a body man and a pretty good mechanic so, restoring it will be on my shoulders. We'll pull the engine out for a rebuild and to paint it, etc. The firewall and engine bay (50K JPEG) needs to be painted. It will be up to Aaron on what if any changes will be done, including a paint color change or not." See also the interior and a rear view photo (50K JPEGs). 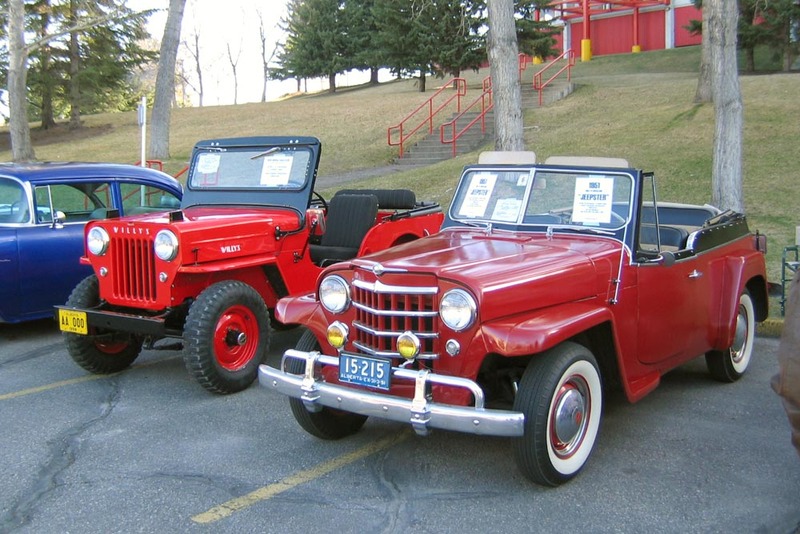 Jim also took a nice photo of the CJ-3B with its garage mate, a '51 Willys Jeepster, at the Spring Thaw car show in April, their first time out with the new acquisition. 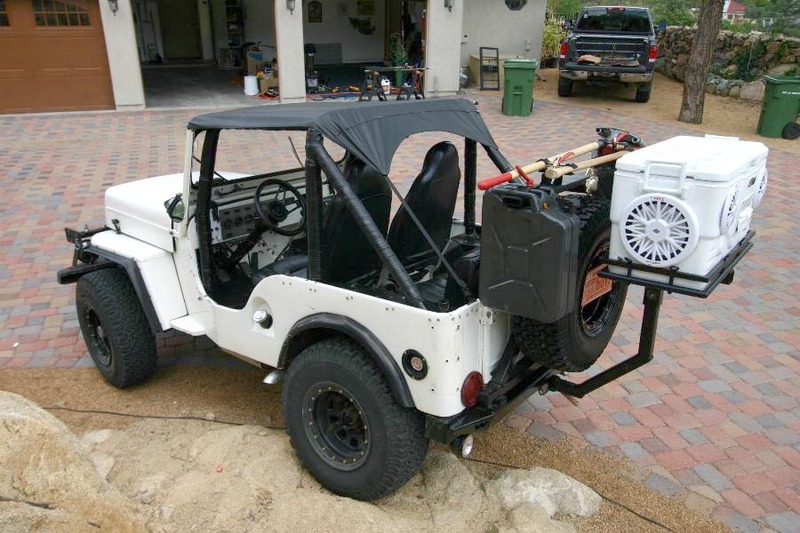 Patrick Schutte in Prescott, Arizona has done a huge amount of work on this trail-ready Jeep, with its custom interior and massive rear equipment rack. Patrick modestly says he's just done "a bunch of mods and custom fab work on it" including winch, hi-lift and lighting on the front grille and bumper. 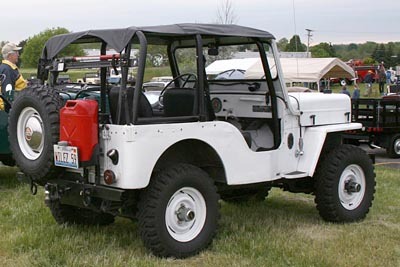 See also the CJ-5-style wiper motor in right side view (130K JPEG) and the wheels and roll cage in a left side view with the top and glass down (130K JPEG). The 225 V6 engine looks ready for a car show, but Patrick doesn't baby this 3B. He recently reported, "Just blew the motor... the oil filter got displaced on a jump and the oil light was not hooked up. Ooops... anyway all the oil ran out.... Going to relocate the oil filter." 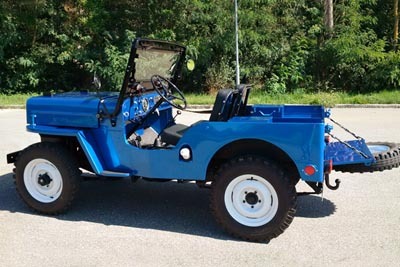 Dave "Hoghead" Ketterman is in Dargan, Maryland, and describes his project: "Starting with a '59 body that has been made to fit a '74 CJ-5 frame. Bought it from a fellow CJ-3B Bulletin Board member, Sean Downey. 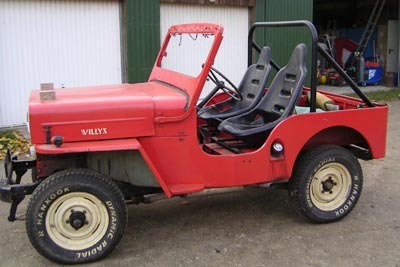 I was looking for a body for my '74 and he told me it had 4" added (100K JPEG) to match the CJ-5... I just had to have it. 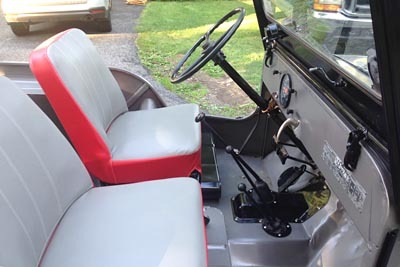 When she is done she will have an AMC 360 with the stock running gear of the '74 CJ-5. The firewall was cut out (100K JPEG) for a V8 conversion." 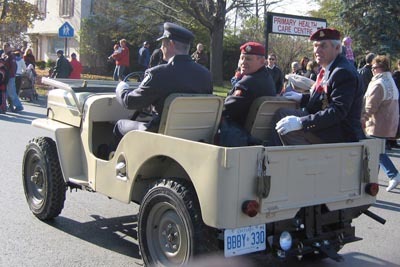 Patrick in Ottawa, Canada found this 3B with an unusual hardtop (120K JPEG). He said, "I have been taking it apart and have been re-working some components on the engine while removing some of the body parts. The tub is in rough shape and has had a few weekend body jobs over the years. I plan on replacing the tub and fenders. 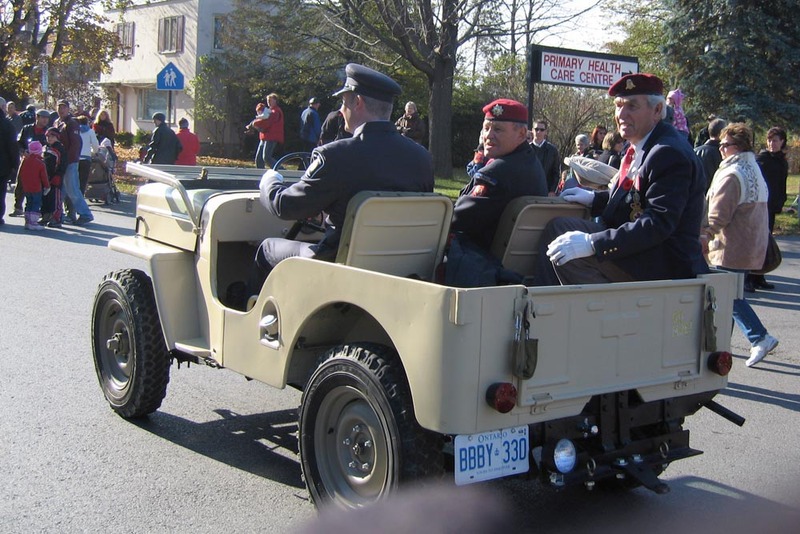 "A fellow firefighter was nice enough to use his truck and trailer (120K JPEG) to help me pick the Jeep up from Denbigh, Ontario. The original top has been scrapped. 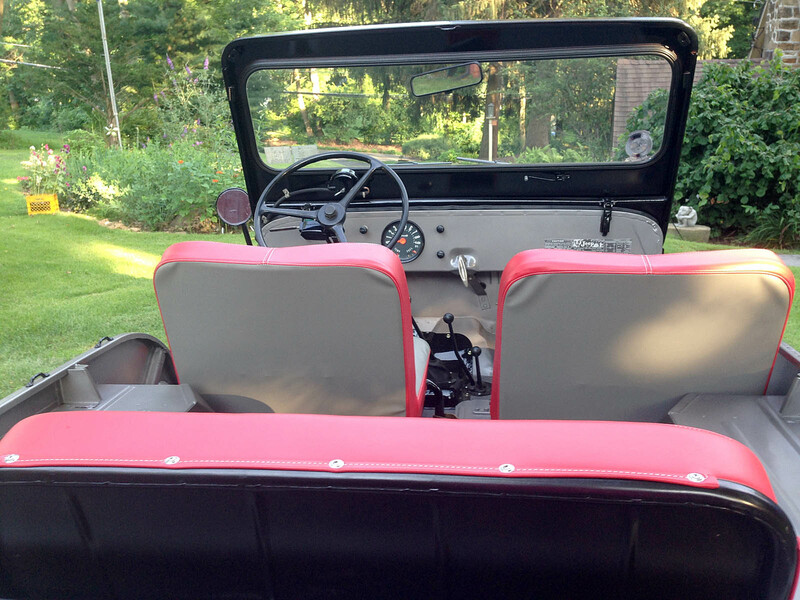 I kept the doors and the rearswinging window, but the top had been riveted in many places and wasmade of aluminum. 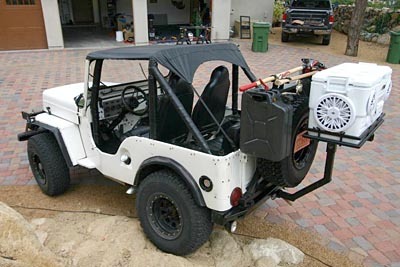 The Jeep also has a Harrison heater and I have cleaned it up and will be trying to get it working." Pat finished the project in time for Remembrance Day 2007 (above). 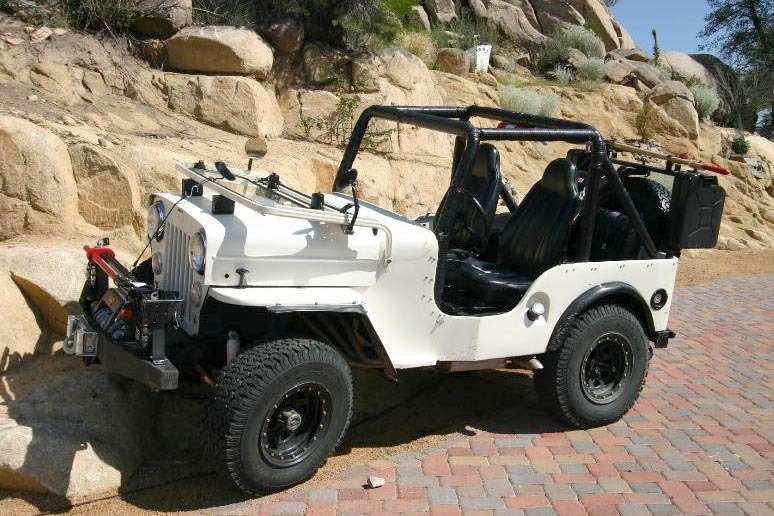 See 1959 CJ-3B Frame-Up Restoration for more photos. 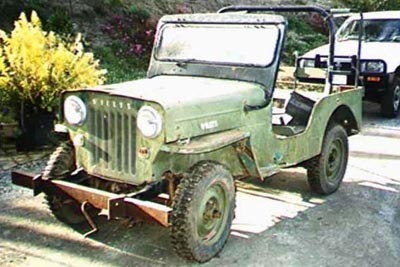 "I bought the Jeep from the Indian Army auction in pretty bad shape. 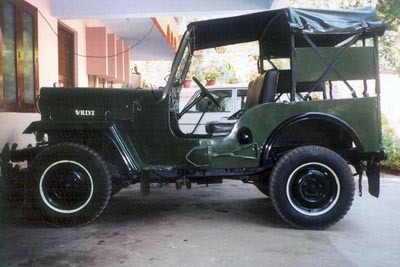 It served in the jungle terrain of Eastern India -- Assam state -- with the Border Security Force. I have since then gone through enormous effort to restore it as it was bought in a pretty bad state. I found two shades of olive green under the paint. I also added the additional fenders as the originals were damaged. See a close view of front fenders and grille (70K JPEG). "It's a regular mountain climber and it's been through all the jungle and mountain trails near my hometown in Kerala, India." 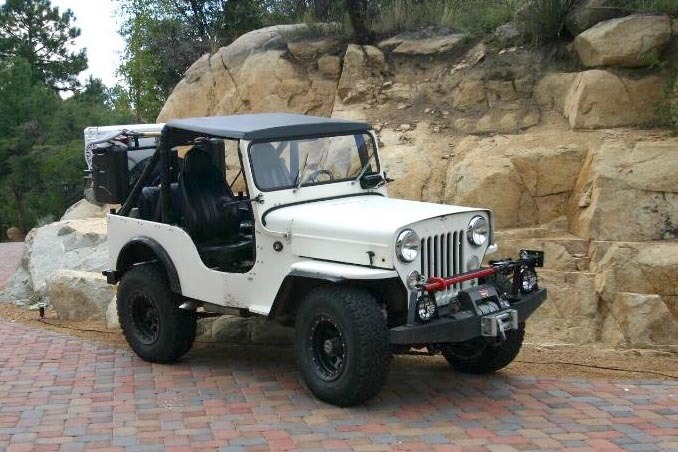 Mitch bought this very original Jeep from Steve Chabot, who commented "The CJ-3B is all stock, and has only 29,000 miles on the odometer. It is still wearing the original paint and I have found no quick fixes on the frame or body. 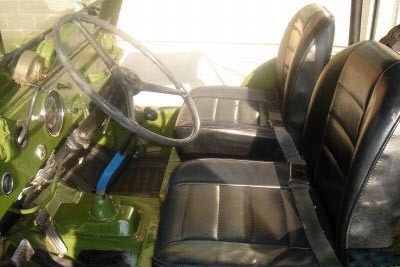 The toe steps, rear corners, rear fender wells, floor supports, and the driver's side floor board all have small holes and have to be repaired. 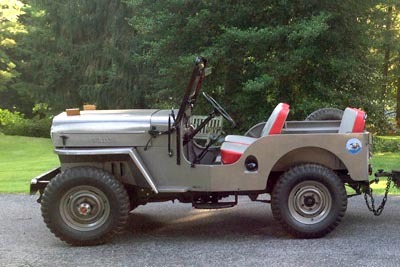 The best part is that it has more style than any other model Jeep, and at forty years old and no modifications, I can jump in and go." Mitch is planning a restoration. 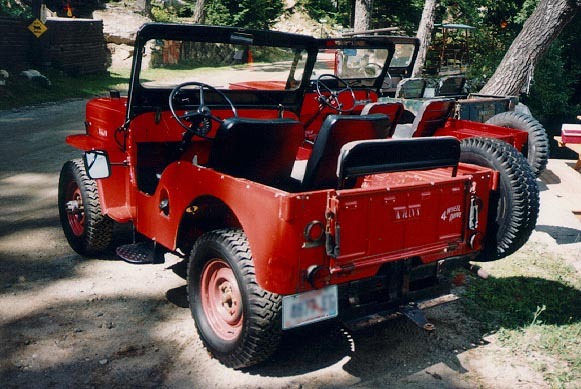 See Sunday Driver for more photos of the Jeep when Steve owned it in Maine. "I am originally from Anacoco, Louisiana which is about 100 miles south of Shreveport. 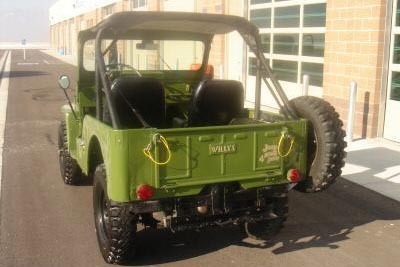 I got my interest in 4-wheel-drive vehicles out of necessity for hunting the swamps of Louisiana. 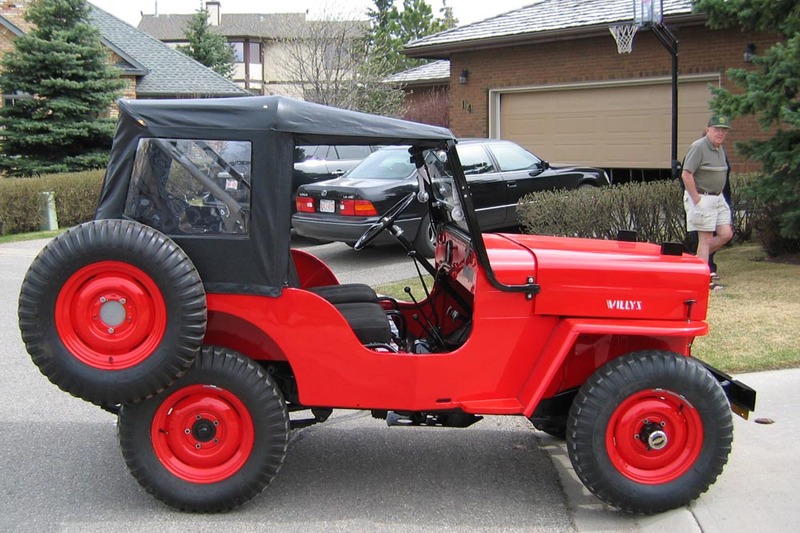 "I bought my CJ-3B for $650 as a basket case and did a body-off repaint and derust of the underside of the body and parts. I spent from February '98 till about October before I could drive it. 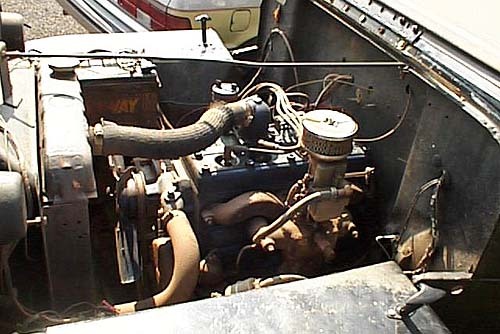 The original engine was waiting for a rebuild, but I lucked into a '46 L-head engine (40K JPEG) for $150 and put new bearings and rings in it, to run until I could afford to rebuild the F-head right." 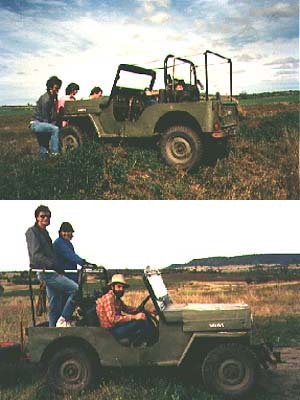 See also a photo with the windshield down (40K JPEG). Note: Michael has since sold this Jeep. 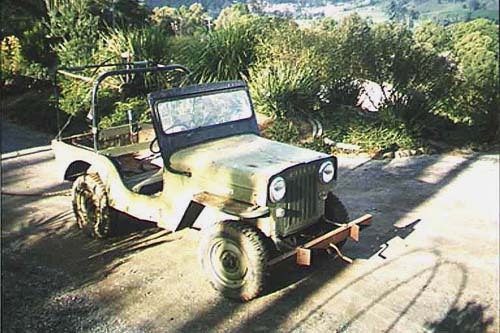 Jeff Spencer in Australia says, "I have several CJ-3Bs in various states. This one dates from between 1958-61 -- no later because the handbrake is (or was) of the 'L' type not the 'T' type. It was used by several people in one district, all on farms, with the last person being a part time 'roo shooter. The consequence is it's had a rough life. The tool box and fuel tank have been cut out and a bench seat put in, not to mention the rust being bogged up. As you can see I have a lot of work to do on this one. See also a photo from the right side (50K JPEG). 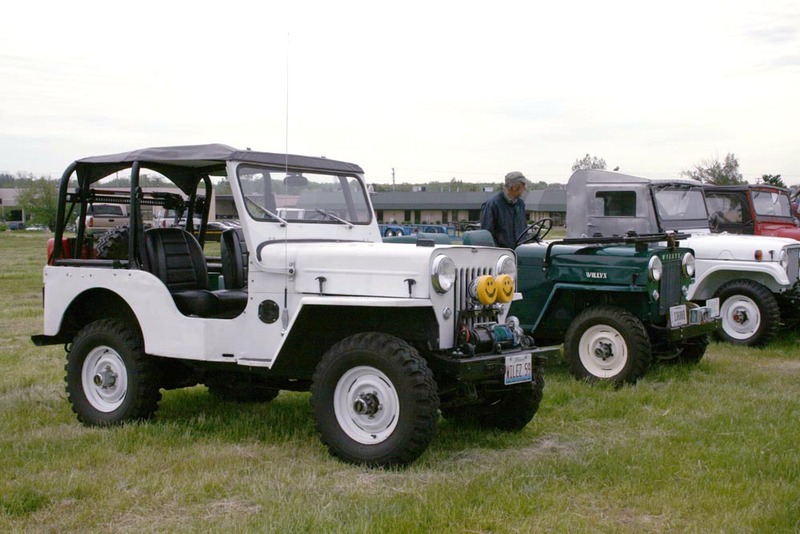 "The other two Jeeps are all pulled apart (bought that way), one being early 50's with left-hand-drive, the other late 50's with right-hand-drive. 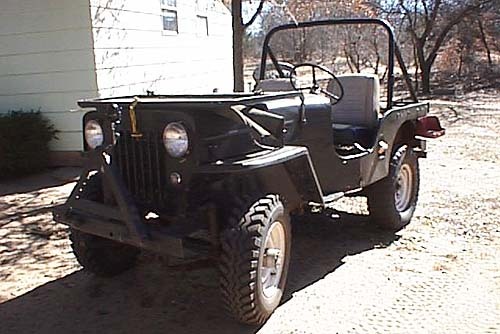 I should get one Jeep out of it all, and maybe a second if I track down some other parts such as seats, fuel tank, etc. "There's also a photo of me with my recovery team pushing me off a contour bank (30K JPEG). This is from when I lived on a property out west." Nils Lessmann lives in Germany. 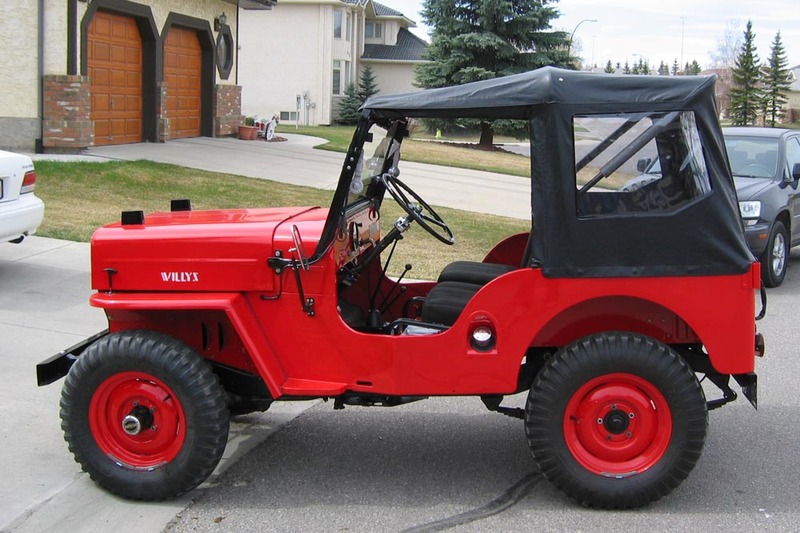 He says the Jeep is mechanically all original, although the seats have been replaced and the front blinkers and roll bar added. 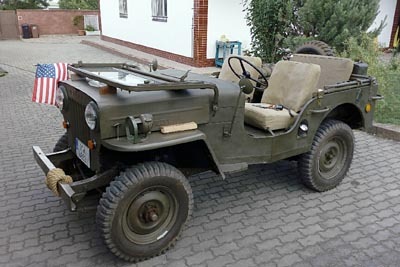 A German tag on the firewall (60K JPEG) carries the 1959 Willys serial number 54876 (which also is stamped on the frame) but not the 57348 prefix. 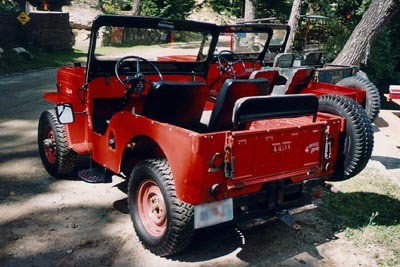 The model is identified as CJ3, but no "baujahr" (year built) is entered. 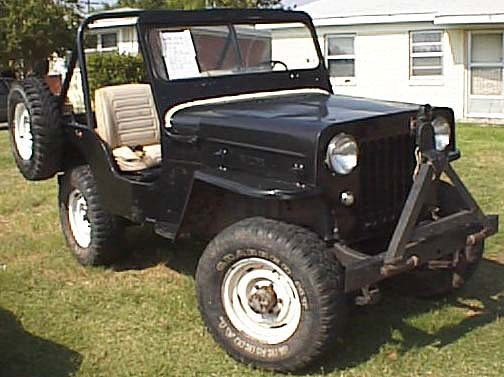 The Jeep is registered as a '61. A rear view photo (90K JPEG) shows the new bodywork replacing the tailgate. 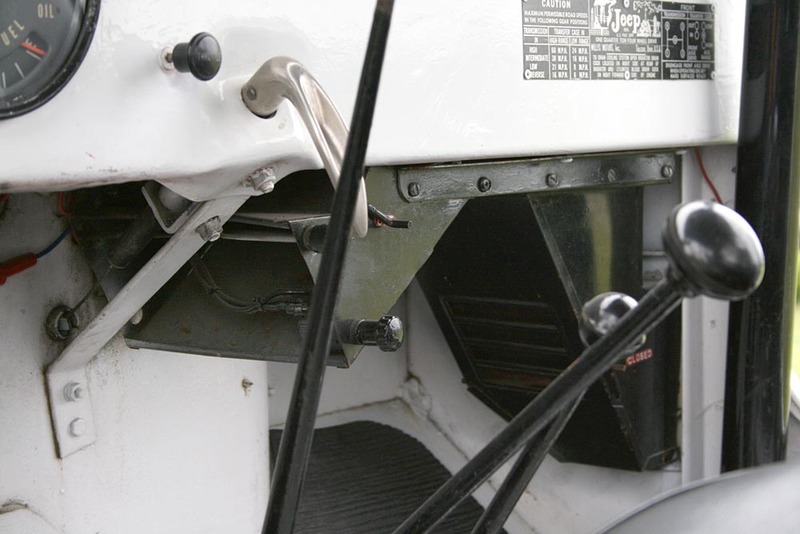 A Porsche diesel tractor in Nils' garage is visible in a photo of the dashboard (90K JPEG). I guess my 3B is actually a 1959 model, although it's registered as a 1961. It spent about 25 years plowing snow from one long driveway before I acquired it. It had been repainted a couple of times, and I approximated what I now know is Fountain Green paint simply by finding the closest match I could ('72 Ford Chelsea Green Metallic) to the original paint under the hood. See more Project Photos, taken before, after and during. See also High Hood in the Snow, and Tracks in the Sand.